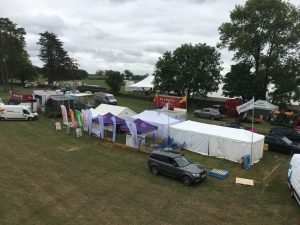 The Mid-Somerset Agricultural Society, which runs the annual one-day show in Shepton Mallet, has successfully completed a series of land deals, securing the show’s future. The Society previously owned 1.6 acres of the show site which, with some land rented from the Duchy of Cornwall, made up less than a third of the area occupied by this year’ show. The remainder of the site has been generously lent to the Society, for more than 100 years, by the Vagg family and the Duchy of Cornwall. Chairman of the Mid-Somerset Agricultural Society, Ian Harvey, said: “We have effectively borrowed land each year to run the show which has meant that much of the infrastructure – trackway, water, electricity, toilets, etc, – have to be installed and removed each year and with no guarantee that the land will always be available. The Society now has the security of a site, part owned, part leased for 125 years and part rented for a minimum of 42 years. This presents us with a very exciting opportunity to further improve the show and the facilities we provide.